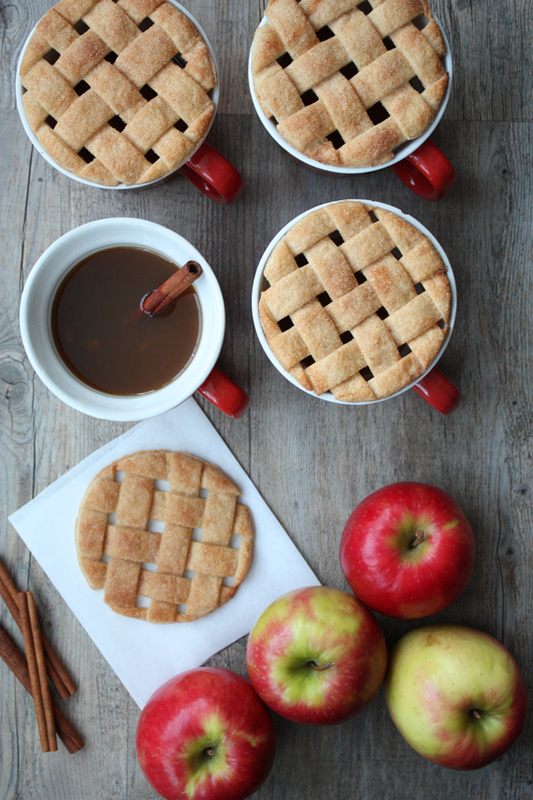 To continue our week of pie crust ideas, these lattice cup toppers are one of my favorite projects for fall! They are simple to make – just a bit of cutting and criss-crossing and you will be quickly on the way to wowing your guests. The baked toppers keep warm drinks toasty while you finish dinner, and they are the perfect treat to have alongside cider. Make the crusts by rolling out dough for two pie crusts, if you’re making your own you can roll it into rectangular shapes (If you use the pre-made dough I promise I won’t tell). Using a pizza cutter, slice each set of dough into 1/2 or 3/4 inch strips. Arrange one set of pie strips about 1/4 inch apart on some parchment paper, or a silicone baking mat. This will make it easy to slide onto your baking sheet later. Create a lattice from the pie dough, weaving the strips together as shown above. Place a sheet of parchment on top and gently press the dough flat. This will keep the final lattice structure from falling apart. 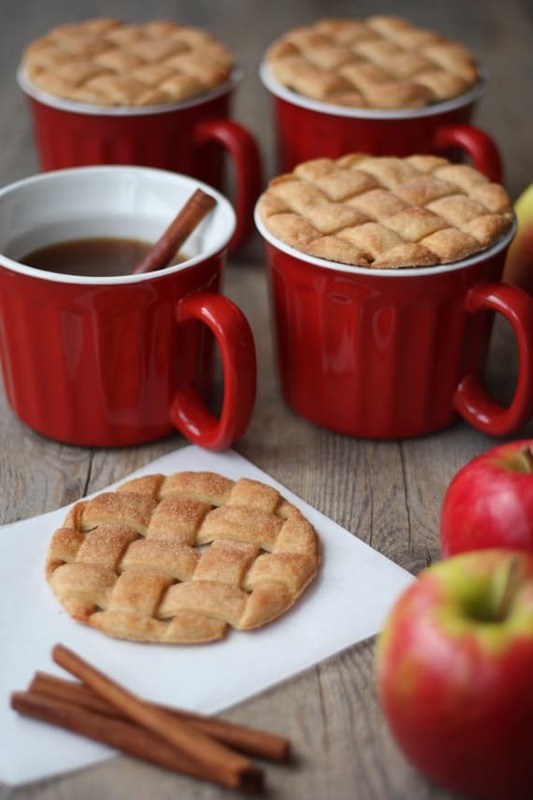 Cut out rounds using a cutter or bowl slightly larger than the mugs you plan on using to serve the cider. If you’re using a cutter, flip it upside down and use the dull edge. This will further secure the lattice. Remove the leftover dough from around your cut out circles. Brush the tops with a little egg white and sprinkle lightly with cinnamon sugar. I used 1/4 cup sugar mixed with 1 teaspoon cinnamon. Bake at 400 degrees for about 10 minutes or until golden brown. You may remember a couple of these photos styled by Megan from Not Martha done last year for A Subtle Revelry, Styled. No2. 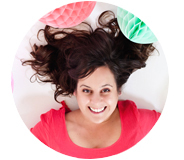 I will be sharing extra photos and more information on some of my favorite projects from the past issues of Styled. over the next couple of months. All the new issues have posts directly relating to their articles in place – you can search for extra photos and info on any of the current articles here. PS. There’s a new issue coming out soon! Great idea, and yum too! Yum! Makes me want one right now! So absolutely cute and I bet so delicious! oh wow! what a great idea! totally doing this the next cold spell we get. This just blew my mind. Really, really fabulous, unique idea. that’s absolutely great!! – sooo cute!! I LOVE this idea. It would make the perfect after dinner surprise for Thanksgiving guests. Or hot chocolate waiting for Santa! Pingback: Stumbling Over Chaos :: The cat ate my super awesome linkity title. Really. These look perfect! I know if I made them, they’d be slightly ‘rustic’ looking. This is a great idea! Adorable! For Christmas, I got a pack of “Stroopie” which are syruppy waffle cookies designed to sit on top of a hot mug. I’d never eaten anything like that, but I thought it was so cool – so I love this variation of sweets-sitting-on-top-of-mugs! Pingback: 38 Clever Christmas Food Hacks That Will Make Your Life So Much Easier | Arlen Benny Cenac, Jr.
Look cute!! Really want to try this!